Flip a coin. If heads, defending Pokémon takes 200 damage and the next attack at Mewtwo is deflected back at the opposing Pokémon. If tails, defending Pokémon takes 200 damage. Flip a coin. 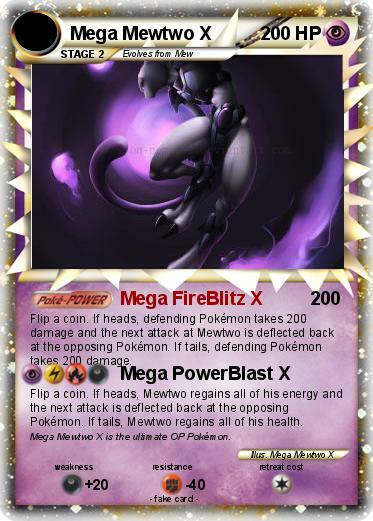 If heads, Mewtwo regains all of his energy and the next attack is deflected back at the opposing Pokémon. If tails, Mewtwo regains all of his health. Comments : Mega Mewtwo X is the ultimate OP Pokémon.